Shanghai city is metropolis and although it is full of architectural masterpieces it does not offer much natural scenery. The Water Villages are becoming more and more commercialized and the beaches are very crowded. To flee the crowds and the clouds of Shanghai, why escape a little way from Shanghai to the to Sheshan, Qingpu, Chongming or Changxing Districts; the 4 smart choices for a weekend excursion and which are all just a few hours away from the city. Sheshan，also known as Sheshan National Forest Park, has 12 hills, including East Sheshan which is 98 meters high and West Sheshan which is 97 meters high. They are the highest peaks near Shanghai and a great place to wind down. The most famous attraction is the Church of the Holy Mother built by Jesuits during the late 19 century and is the destination for pilgrimages for Catholics along the coast of southeast China. It is wise to avoid it in May as it can be very crowded. 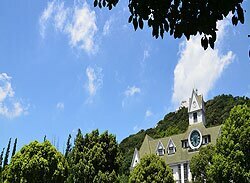 The Sheshan Observatory and Astronomical Museum is near the Church of the Holy Mother. The Shanghai Sculpture Park is another highlight. Over 60 sculptures featuring the theme of Moon Lake (Yue Hu) are set along the bank of the lake. If you are in the mood for a game of golf, the Sheshan Golf Estate Country Club is handy. This area offers both moderate and luxury stays. The Secret Stream Inn at the foot of Sheshan is comfortable while a deluxe environment is provided at Homa Moon Lake Hotel of Modern Art. Take Tourist Buses, which leave from Shanghai Stadium, Nanpu Bridge, Shanghai North Coach Station or Shanghai West Railway Station direct to Sheshan. The fare is about 10 Yuan/person. Qingpu borders on Kunshan in Jiangsu Province but is just a few hours away from the downtown of Shanghai but has none of the hustle and bustle of city life. The lakes in this area play a significant role and Qingpu is no exception. The Dianshan Lake resembles a gourd and is 12 times bigger than West Lake in Hangzhou. The lake boosts beautiful scenery as well as being home to aquatic sports. The lake is used as a train venue and host international rowing events. Zhujiajiao Water Village – “A Pearl in Jiangnan” offers both history and scenery and has 36 ancient bridges and ancient house from Ming and Qing Dynasties on the banks of the rivers. Stay a night to experience the peaceful, starry night. Ascend to Guanyin Hall at Baoguo Temple for a wonderful view of Dianshan Lake. A night in the water town would be a highlight. Stay at one of the local hostels like Caotang Hostel(草堂客栈) which is Ming-Qing dynasties style for those on a budget or the West Well(西井汇). Uma Hostel is hidden in an alley and is small but elegant. The alternative is to stay in Qingpu District where there are more accommodation options. There are several routes. The most convenient route is to take the High-speed Line Shanghai-Qingpu, tourist bus at People Square Station on Jingling Road, Puan Road at a ticket fare of 10 Yuan/person. The bus departs every 10 minutes and stops operating at 22:00. 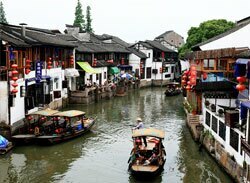 Or at the same stop you can take the High-speed Line Shanghai-Zhujiajiao, tourist bus that takes you to the water town. The ticket fare is 12 Yuan/person. The bus departs every 20 minutes on weekends. Chongming Island is the third biggest island in China. The charm of the island varies with the changing seasons. Spring and autumns are the best time for bird watching thanks to a variety of bird species. Delicious seafood can be found in autumn while it is place to escape the hot summer. Crabs and reeds could be seen everywhere and is part of the unique characteristics of the island. Eastern Beach is a highlight. 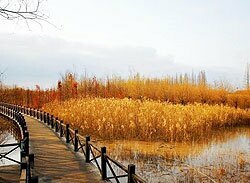 The Eastern Wetland Park has an entrance price of 50 Yuan/person however just skip the gate of the park and go down the road to the end where the wetland meets Eastern Beach. A vast expanse of reeds and the protection zone for migratory birds can be seen on the trestle bridge. A Specimen Hall is on the bridge for visitors to learn about migratory birds. The other attractions are Dongping National Forest Park, Shanghai’s biggest eco-park. A wide range of vegetation makes the park an ideal place to survive the hot summer. Nanmen Dock is also a must-visit for first-time travelers and offers a unique angle for appreciating the beautiful sunset. 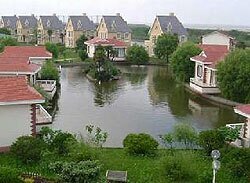 Main accommodation on Chongming Island is offered by farm stay and holiday villages. Most farm stays in Qianwei Village, Lugang Village and Xilai Village. Hotel such as MOTEL 168 and Greentree Inn are easy to find. Going to Chongming Island would involve a ferry. Take Line 5, tourist bus which costs 8 Yuan/person at tourism center near Shanghai stadium to Baoyang Dock, then transfer to Nanmen Dock of Chongming Island by ferry at a cost of 12 Yuan. It is easy to get to every part of the island. The other option is to take Shen Chong Tourism Line at NO 985, Gonghexin Road, to go directly to the destination. Only a half-hour driving time from the city center of Shanghai, the beauty of Changxing Island is well know and popular with Shanghai people. The island is known as the hometown of mandarin oranges. No wonder as there are a many orchards on the island. It is a perfect place for outing with families or friends. Row -boating, photography, and orange picking provide a weekend full of activities and sightseeing. Chuizhu Orchard stands apart from all the gardens because of its classical southern garden style size. In late autumn, the island holds Shanghai Mandarin Oranges Festival which has a rich variety of activities to celebrate the harvest. The best choices are Jiehui Hotel and the Captain Hotel; both have moderate prices. On arriving at ferry dock, you can also ask staff there for information about hotels. They will assist you with booking. The easiest and cheapest way to reach Changxing Island is to firstly take Metro Line 2 at People’s Square station and get off at Shanghai Science and Technology Museum station. Then transfer to Shen Chong Line 4 which goes to Changxing directly. It will take about 4 hours.